I am Looking for a Black Forest Cake Recipe, I have a General Idea but have not found one yet. And i live is South Africa, Some recipes require Double Cream which we do not have, any suggestions as to what i can use to substitute it? i googled and found these. i hope it helps. Preheat oven to 350 degrees F (175 degrees C). Line the bottoms of two 8 inch round pans with parchment paper circles. Sift together flour, cocoa, baking soda and 1 teaspoon salt. Set aside. Cream shortening and sugar until light and fluffy. Beat in eggs and vanilla. Beat in flour mixture, alternating with buttermilk, until combined. Pour into 2 round 8 inch pans. Bake at 350 degrees F (175 degrees C) for 35 to 40 minutes, or until a toothpick inserted into the cake comes out clean. Cool completely. Remove paper from the cakes. Cut each layer in half, horizontally, making 4 layers total. Sprinkle layers with the 1/2 cup kirshwasser. In a medium bowl, cream the butter until light and fluffy. Add confectioners sugar, pinch of salt, and coffee; beat until smooth. If the consistency is too thick, add a couple teaspoons of cherry juice or milk. Spread first layer of cake with 1/3 of the filling. Top with 1/3 of the cherries. Repeat with the remaining layers. In a separate bowl, whip the cream to stiff peaks. Beat in 1/2 teaspoon vanilla and 1 tablespoon kirshwasser. Frost top and sides of cake. Sprinkle with chocolate curls made by using a potato peeler on semisweet baking chocolate. Black Forest gateau (also commonly called Black Forest cake in the USA and Australia) is the English name for the southern German dessert Schwarzwälder Kirschtorte (literally "Black Forest Cherry Cake"). It originated in the Black Forest region of southern Germany, but it is a popular dessert throughout Germany, Austria, and the world. Typically, Black Forest gateau consists of several layers of chocolate cake, with whipped cream and cherries between each layer. These layers are topped with additional whipped cream, maraschino cherries, and chocolate shavings. In some European traditions sour cherries are used both between the layers and for decorating the top. Traditionally, the cake is saturated with Kirschwasser (cherry brandy), although other liquors are also used (rum is common in Austrian recipes). 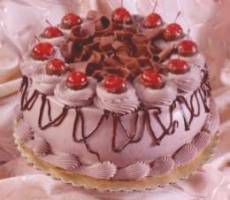 In the USA, Black Forest gateau is most often prepared without alcohol. Preheat oven to 350 degrees F (180 C). Butter three 7-inch cake pans, line them with wax paper and butter and flour the paper. In the top of a double boiler set over simmering water melt the chocolate with the butter, vanilla and water, stirring until smooth. Remove the pan from heat. Into a bowl sift together the flour and salt. In a bowl with an electric mixer beat the eggs with the sugar for 5 to 10 minutes, or until batter ribbons when beaters are lifted. Fold flour mixture into egg mixture until just combined and fold in chocolate mixture gently but thoroughly. Pour batter into pans, smoothing the tops, and bake for 10 to 15 minutes, or until cake tester inserted in center comes out clean. Let cool in pans 5 minutes. Run knife around edge of pans and invert onto racks to cool completely. In a saucepan combine reserved cherry juice, sugar and cornstarch. Bring mixture to a boil over moderate heat, stirring, and simmer, stirring, for 1 to 2 minutes, or until thickened. Stir in cherries and kirsch, transfer to a bowl and let cool. Filling may be made 1 day in advance and kept covered and chilled. In a saucepan combine the sugar and water, bring to a simmer, stirring, and simmer until sugar is dissolved. Remove pan from heat and stir in Kirsch. Let cool. In small saucepan combine gelatin and Kirsch and let soften 5 minutes. Gently heat mixture over low heat, stirring, until liquid is clear. Remove from heat. In chilled bowl with chilled beaters beat cream until it holds soft peaks, add sugar, cocoa, and vanilla and beat until it holds stiff peaks. Add gelatin mixture in stream, beating, and beat until it holds stiff peaks. Invert one layer of cake onto a cardboard round, brush with some of syrup and spread half cherry filling over it. Spread 1 1/2 cups of whipped cream over cherries, sprinkle with 1/4 cup chocolate shavings and invert second layer of genoise onto cake. Brush with syrup, spread with remaining cherry filling and top with 1 1/2 cups whipped cream, spreading it into an even layer. Sprinkle with 1/4 cup of chocolate shavings and invert third genoise layer onto cake. Brush top with syrup and spread remaining whipped cream over top and sides of cake reserving about 2/3 cup for garnish. Transfer remaining whipped cream to a pastry bag fitted with a large star tip, pipe rosettes decoratively around top and bottom edge of cake and top the rosettes (on top edges of cake) with glaceed cherries. Sprinkle top of cake with remaining chocolate shavings and let cake stand, covered and chilled, for at least 3 hours and up to 8 hours. Store cake in refrigerator.